Do you know what Haggis is? (A Scottish dish consisting of a sheep’s or calf’s offal mixed with suet, oatmeal, and seasoning and boiled in a bag, traditionally one made from the animal’s stomach). Now that you know what it is; would you like to throw it? That’s Haggis Hurling. 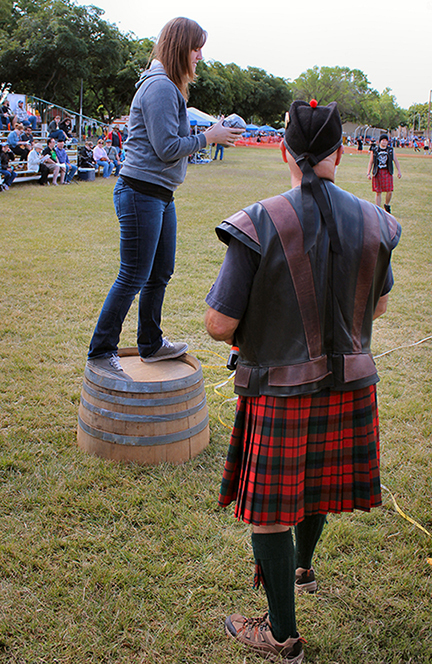 Can you stand on a wine barrel and throw it further than anyone else? It’s a lot of fun and the winners get a prize. Join us in the Main Ceremony area (21) at 10am both Saturday and Sunday. Chairperson Stuart McNaughton will be glad to explain how it works. We also have a category for children so this sport is for everyone. Join in the fun. We’ll see you there.